According to the engineer who is in charge of salvaging the Costa Concordia cruise ship it will now be towed away from the Italian Island of Giglio in by the end of June 2014. The ship is currently in the up right position on the shore of Giglio. For the ship to be taken away it must first be re-floated which will be another huge operation for engineers. Large tanks are being added to the other side of Concordia which already has them on one side from putting the ship upright in the Parbuckling operation back in September. Once the new tanks have been added the ship will then be able to float away from the underwater platform which was constructed before up righting the ship. Costa Concordia will floated on top of the worlds largest submersible ship the Dockwise Vanguard which will then take the 114,500 ton Concordia to be scrapped. The scrapping destination is yet unknown but it;s expected to be as near as possible in Italy. 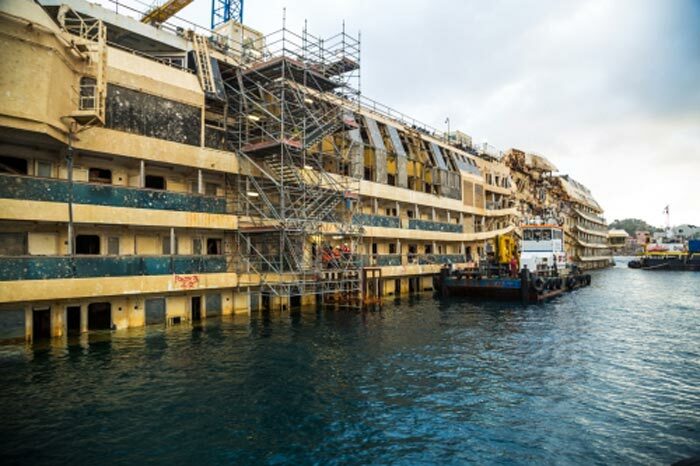 Having the Costa Concordia removed from the Giglio shore will be a welcome sight for locals on the island and can start to put the tragic event behind them. Having the large ship there has been a constant reminder to the people and have never been able to move on as it;s always been in view. Let us know what you think of all the events of the Costa Concordia and about the ship being towed away in June 2014. You may post your comments below.